1) Open the clams in a little boiling water, drain and reserve the liquid. 2) Gently sauté the onion and carrot until soft and golden. 3) Add the grated tomato and allow to reduce. Add the flour, stir in well, and then the wine. 4) Add some of the clam liquid and leave to cook for 30 minutes. 5) Strain, pressing firmly through a sieve, and reserve the liquid. 6) Finely chop the nuts, garlic and saffron in a blender with a little water. Put in a pan with the reserved cooking juices. 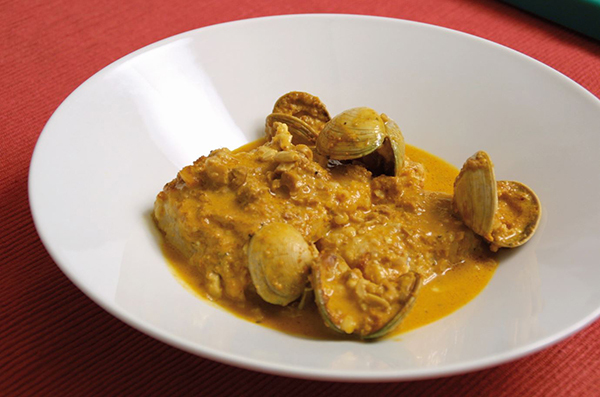 7) Add the fish and cook for 10 minutes over a low heat before finally adding the clams.